Sunday morning began bright and early for me. I was up at a time I hadn't wanted to be up yet, but since I was awake and thinking only of what I was about to do, I felt I might as well get up. I got my breakfast, tried to drink as much as I could, got dressed and then me and Miss Oswin had some cuddling time. For me to calm down, for her because well, is there ever a reason needed? I was out waiting for my partner in crime in good time, checking the flowers in the garden. And again and again. But he arrived, loaded my bike on the back of his car and off we went. Not ten minutes later he parked the car, we got our stuff and were on our way to check in. My bike was deemed okay (16 spokes per wheel minimum and working brakes) and so was my helmet (including Dutch flag ribbons). I then got the seat fastened again and my tires pumped up just a bit more and 'parked' it. Over an hour to go! I started unpacking my stuff and found that the cycle shirt I was due to wear after the swimming was soaking wet. Turned out that the last minute bottle of water had been leaking due to me not closing the lid properly! So, put it on, it was wet anyway. Struggled into my wet suit, then had to go potty, so had to take it half off again. A bit of trouble getting the whole lot on again, but managed in the end. Fifteen minutes to go! I couldn't have drowned if I had wanted to! I made my way with all the other contestants/participants to the water's edge. Had to wait while the first group, who were due to do half the distances, were sent away. The nerves were there, even a tear threatening to come, but managed to talk that one down again. Fife minutes to go! And then: the ribbon was lifted, the group surged forward and I was off as well. On my first ever triathlon. The lack of training of the last few weeks made itself noticed immediately, since I had to stop several times on my first lap. While on the second buoy I was fine, but then got a slight kick in the ribs by somebody lapping me. He hadn't meant to, but it gave me a bit of a bfmpf. But, I got back into the rhythm and managed to complete lap 1. I was hauled up and after a few moments getting my breath back, I waded back in and started on my second lap. By then, far fewer people were in the water and I was dead last. There was somebody close to me taking her wet suit off! while in the water, but she stayed ahead of me the whole time. Again I had to stop several times, but only for short spurts of time. And then I had completed the swimming. Once more I was hauled up and out of the water and the first part was done! I was received on dry land by Coach Jorunn, who was so happy to see me, but also helped me get down to the shifting area. And honestly, I needed all the help I could get, because I had lost the use of my legs! Once in the shifting area, one of the members of the tri-team on the same program helped me get undressed (wet suit) and dressed. Dried my feet, helped me with my shoes, found the number (I had forgotten) and put it on and then sent me on my way. The cycling was remarkably easy to be honest. There were people cheering me on all the way and I managed to have a steady speed. In fact, I had never cycled so fast (on average) as yesterday! And even though it was quite lonely in the end (most of the public had gone and I was the last one cycling), I kept it up and managed to come in in just over an hour. This time I had to change all on my ownsies and it was quite hard. I usually sit down to put on socks, but I knew that if I did that now, I would never get back up again. I had put on one shoe when I realised I had forgotten to put on my knee brace, so off with the shoe, on with the brace and then on with the shoe. Fortunately the second leg went fine and after turning the number from back to front, I was on my way to the last leg of the triathlon! 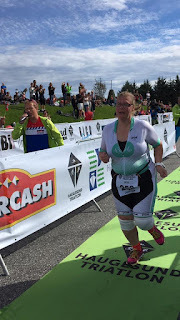 There were a lot of athletes on the path who were due to start the Norwegian Championships soon, so that was a bit tricky, but I soon was on my way to the finish line. After first having to complete three laps. After my first lap I came into the finishing area and was asked by the announcer whether it was fun. NO! And the reason for that was, that I was getting light-headed. I had not had anything to drink other than a small cup of water right after the swimming and a few sips during the cycling. I was getting dehydrated. By the end of the second lap I asked my partner in crime to get me some water (he did and some energy drink) and immediately I perked up. Not that my speed was getting higher, but the light-headedness was gone and I could focus again. 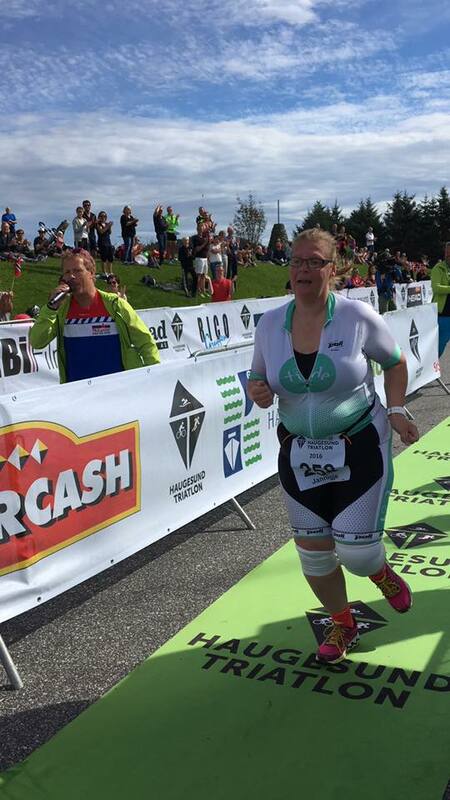 On my third and last approach to the finishing area I was met by PiC and by my dresser Lene, both spurring me on. As did the announcer, who had called every single official, non-official and random person to come to the area and cheer me to the finish line. The tears might have been close, but those last 150 meters I 'ran'. And I made it over that line! I was shaking, I was crying. I got a medal, somebody pushed a cup of water into my hands and told me to drink. But I made it! Will I do it again? YES! Because once I can crawl instead of doing the breast stroke and once I can run instead of walk... it should be even more fun than it was now! My final times? Swimming: 28 minutes, cycling: 1.05 and running: 52 minutes. Add to that the changing times and it totaled 2 hours, 33 minutes and 45 seconds. I just commented but it didn't seem to take. So I am saying that you should be very proud of yourself. Veldig stolt av deg Mara! Wow! You had a great time and exceeded your expectations!! How nice that you shared the experience with us! Congrats! And remember that you beat everyone who never showed up for the race and that was a whole lot of people! You should be VERY proud of yourself and this great accomplishment!! I agree. Some say they could never have done it, well, I thought the same and I did it! And I am very proud of myself! It was worth taking the time to read! Thank you for filling us in on all the details. I'm so proud of you for finishing!!! I enjoyed hearing about your experience of the tri-athlon. You did so well, Mara. Congratulations. Thank you. I am very happy with my time and effort as well. And apart from being seriously dehydrated (which caused a headache of course) no other ill-effects at all! Crikey Mara ... Mums crying reading this! She's so happy for you! Kidd'n that's not weird. She's happy for you and she's CRYING?? You must be so proud of yourself ... Well done! What an achievement! Mum wants to kiss you! Lucky you're so far away, aye? We hope you keep letting us know all about how you are going. Imagine how well you'll go next year with a full twelve months of training. Congratulations! Kisses gratefully received. I am very proud of myself and am planning to keep this up. In fact, once I get back from my holiday I am planning to become a member of the local triathlon club and start training for next year's triathlon! Oh this is just brilliant Mara - all your pals out here are bursting with pride for you!!! I'm with Charlie's mum - wanna hug and kiss ya - but sentimental drivel like this will have to do... hoorrrahhhh hooorrrahhhh hooorrrrahhhhhh. Again, kisses gratefully received! Thank you for the hoorrahhhs! I must admit I was thinking of all of you when completing, but especially Janice Adcock (she had predicted the best time and I so wanted to reach that). Congratulations !! You made it ! You can be proud of yourself ! Clapping wildly!! Mara you set a goal, you trained you stuck to and and WELL DONE my friend you finished!! Excellent!! Many, many congratulations. What an achievement. You remind of my kids when they were little. You asked them if they needed to go potty before they get into their snowsuits...LOL! Of course they had to go after it was on. That is one great accomplishment Mara. Way to go....you did it!! You should be so proud of yourself.